On May 15, the HPWREN team participated in a UCSD activity that demonstrated an ad-hoc and temporary multi-media installation of seismic and visual instrumentation at the Coronado Bridge. The installation provided wireless IP access, using off-the-shelf 802.11b technology, from the bridge to the UCSD campus, where participants examined and discussed the feasibility of a permanent networked monitoring system of this type. The system would specifically be used for UCSD research aimed at the crisis management community. 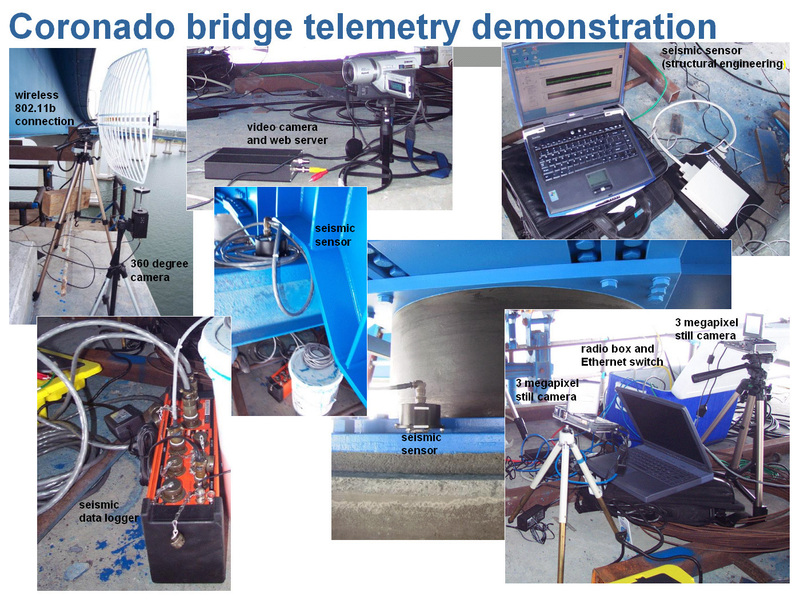 The demonstration was the first major step in testing the feasibility and understanding the values of a remote monitoring system, and was conducted after several local and federal government agencies expressed an interest in working with UCSD in developing and deploying multi-functional sensor networks on the Coronado Bridge for the purpose of seismic/infrastructure monitoring and crisis management of the bridge. In addition, such instrumentation will be usable for security surveillance of the navy piers and nearby waters as a means of directly addressing principal homeland security and defense needs. "To this end, our primary objective at UCSD was to demonstrate an ad-hoc and temporary multi-media installation of seismic and visual instrumentation at the Coronado Bridge with remote wireless data access to the UCSD Campus," explained Frieder Seible, School of Engineering Dean. 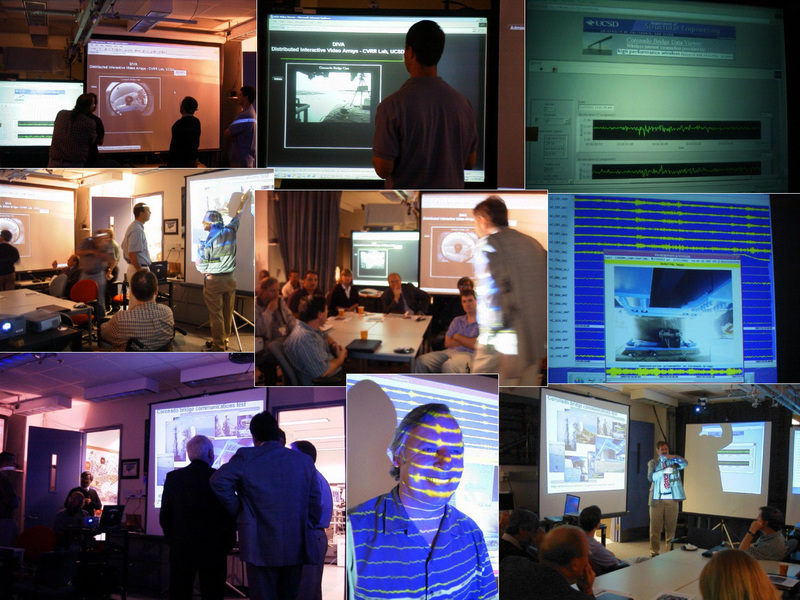 "Our two goals were 1) to assess the feasibility and 2) to discuss the added value of such a networked monitoring system for UCSD research and involved government agencies." Click on the above image for enlarged version of demonstration diagram. The monitoring system connectivity originated from the HPWREN 45Mbps backbone node at the San Diego Supercomputer Center, where the link connected to Mount Soledad, and from there via a microwave tower mounted grid antenna to a tripod-mounted grid antenna atop the Coronado Bridge. 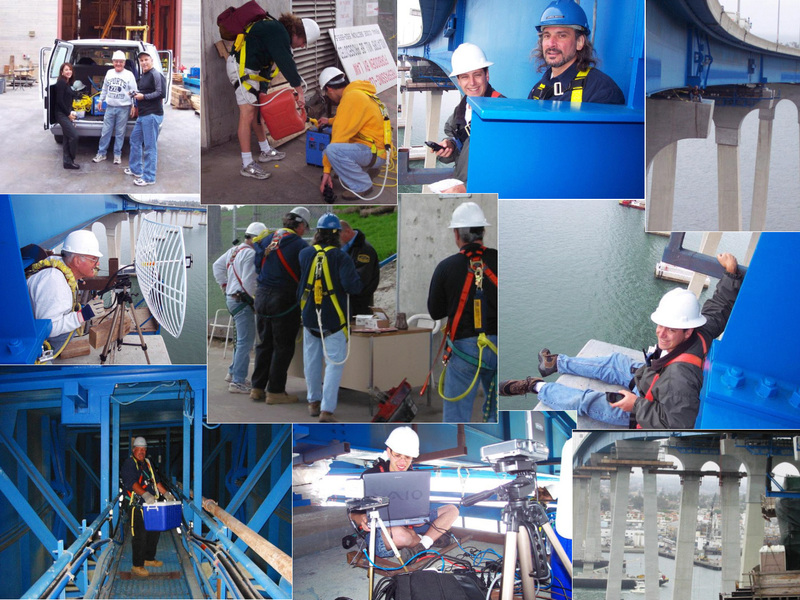 Two seismic episensors, two accelerometers, two digital high resolution Internet accessible still cameras, one omni-directional 360 camera and one standard video camera were deployed on pier 14 at almost 200 feet altitude right below the Coronado Bridge. Seismic and visual data was captured and transmitted via HPWREN through Mount Soledad and SDSC to the UCSD campus. A variety of local and federal government agencies joined UCSD researchers in viewing the wireless data as it was transmitted live and displayed on five screens in Professor Mohan Trivedi's Visualization lab. "Those attending the demonstration were unanimously impressed and expressed interest in what they saw as potentially valuable for their agencies," said Seible. "Plans continue for the narrowing of focus to produce an end product that serves the specific needs of the various involved agencies as well as providing meaningful research parameters for UCSD." Additional photographs regarding the Coronado Bridge activity are available at http://hpwren.ucsd.edu/Photos/sites.html#Coronado.